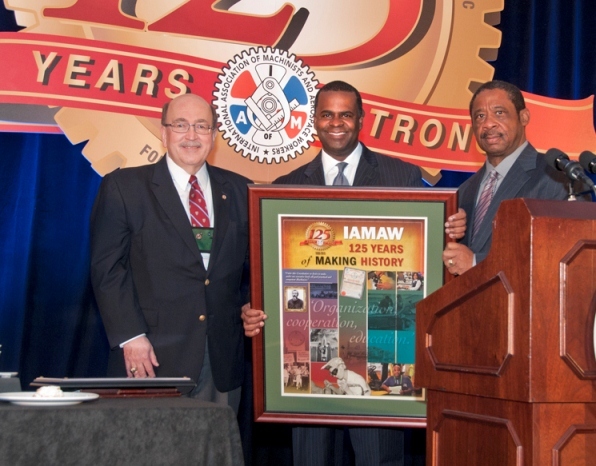 IAM International President Tom Buffenbarger, left, and IAM General Secretary-Treasurer Robert Roach, Jr., right, present Atlanta Mayor Kasim Reed with a plaque commemorating the IAM’s 125th anniversary. The IAM is celebrating its 125th birthday in Atlanta, the city of the union’s founding, with the opening of the 2013 IAM National Staff Conference. Speakers commemorated the progress of a union that has grown from 19 machinists secretly meeting in an Atlanta locomotive pit in 1888 to an international organization of 700,000 active and retired members the IAM boasts today. After establishing “Lodge No. 1” in Atlanta, the IAM grew quickly, adding 34 local lodges in one year and increasing membership from 19 to 1,500. The eight-hour day, a living wage and respect for skilled trades were among their earliest goals. In his speech, Buffenbarger called for a renewed energy to organizing future IAM members and spreading the benefits of union membership to new demographics. 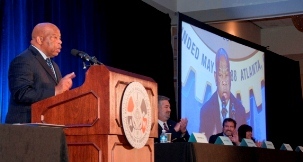 Rep. John Lewis (D-GA) addresses the hundreds of IAM staff present at the 2013 Staff Conference, telling members he is thankful for their support through the 26 years he’s been in Congress. Speakers at the conference included Rep. John Lewis (D-GA), Atlanta Mayor Kasim Reed, Georgia State AFL-CIO President and Machinist member Charlie Flemming and IAM leadership that spoke on the importance of organizing, health care reform and the preservation of labor history. Mayor Reed presented Buffenbarger with the city’s highest honor, the Phoenix Award – a symbol of Atlanta rising again after being completely destroyed by Sherman’s March in 1864. IAM Southern Territory General Vice President Robert Martinez Jr., said that despite attacks on labor from Republican politicians, especially in the South, the IAM would continue to fight for working Americans in the region where it was born.